Our investment concepts can be considered as crucial strategic building blocks. While the net equity ratio in our long/short fund is below 30% at any time we are predominantly fully invested in our "long only" equity fund. The two investment concepts thus have a completely different profile. The long/short fund is uncorrelated to equity and bond markets. On the other side the "long only" equity fund can be classified as an equity investment, but diversifies a blue chip equity portfolio. The goal of asset allocation is to optimize the risk/return profile of an investment in a customer-oriented manner. It starts with a strategic asset allocation, i.e. proper long-term asset allocation to various investment classes. It is a way to reduce market risks such as stock market and interest rate risks through diversification. However, given the historically low interest rates, fixed income securities are unlikely to provide a positive return and a compensatory contribution to equity returns. Therefore, investing in alternative asset classes such as long/short is recommended regardless of the interest rate cycle. In addition, results (Markowitz optimization) show that Small & Mid Caps generate significantly higher returns than Blue Chips given the same volatility level. The optimal risk/return profile is indicated at a share of 50% of Small & Mid Caps in a stock portfolio. Studies show that a long-term investment horizon and holding on to the initial strategic asset allocation leads to the superior results. Tactical asset allocation, i.e. changing investment quotas in the short-term leads to significant loss of wealth, especially in volatile markets. Since markets cannot be forecasted in the short-term, it is not recommended to change the portfolio structure on a frequent basis. 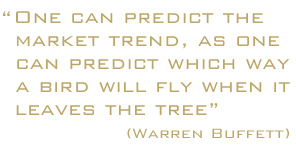 We follow this advice also based on the individual stock level. Bitte beachten Sie, dass die Informationen auf dieser Internetseite grundsätzlich nur professionellen Anlegern mit Sitz in Deutschland im Sinne des §67 WpHG vorbehalten sind. Die Anlageberatung nach § 1 Abs. 1a Nr. 1 a KWG und die Anlagevermittlung nach § 1 Abs. 1a Nr. 1 KWG erfolgen im Auftrag, im Namen, für Rechnung und unter der Haftung des dafür verantwortlichen Haftungsträgers BN & Partners Capital AG, Steinstraße 33, 50374 Erftstadt, nach § 2 Abs. 10 KWG. Die BN & Partners Capital AG verfügt über entsprechende Erlaubnisse der Bundesanstalt für Finanzdienstleistungsaufsicht gemäß §32 KWG. Ich habe den Haftungshinweis zur Kenntnis genommen und bestätige gleichzeitig, dass ich im Sinne des §67 WpHG ein professioneller Anleger mit Sitz in Deutschland bin. Please note that the information contained in this website is intended exclusively for professional investors domiciled in Germany according to section 67 of the Securities Trading Act (Wertpapierhandelsgesetz – WpHG). Investment advice according to section 1 para. 1a no. 1a German Banking Act (Kreditwesengesetz - KWG) and investment brokerage according to section 1 para. 1a no. 1 German Banking Act (Kreditwesengesetz - KWG) will be provided for the account and under the liability of BN & Partners Capital AG according to section 2 para. 10 German Banking Act (Kreditwesengesetz - KWG). BN & Partners Capital AG possesses the required authorisation of Bundesanstalt für Finanzdienstleistungsaufsicht (BaFin) according to section 32 German Banking Act. I acknowledge that I have read the liability notice and confirm that I am a professional investor domiciled in Germany within the meaning of section 67 of the Securities Trading Act (Wertpapierhandelsgesetz – WpHG).